Children and youth exposed to the sights, sounds and stress of domestic violence are affected at every age. The effects of domestic violence can be long lasting. How can you help the youngest victims of domestic violence? 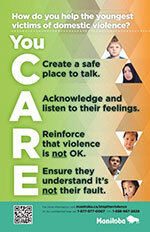 The videos below describe some of the ways children and youth may be affected by domestic violence. 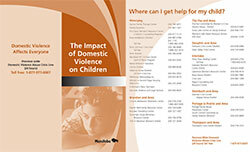 Manitoba Justice, Victim Services has developed further material with more information on how family violence affects children and includes a list of resources and services.